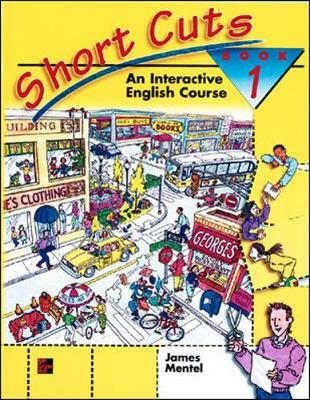 "Short Cuts" is a three-level series for teaching English to young adult and adult students. Each level of the program contains the following components: a student text a teacher's manipulative kit (available in posters); an optional teacher's audio program; and an optional student audio tape a teacher's manual. One of the most unique features of "Short Cuts" is its use of manipulatives, or cut-ups. The use of these manipulatives: addresses a variety of learning styles: visual, aural, and kinesthetic; provides immediate feedback for both teacher and student; focuses students' attention on accomplishing specific tasks during an extended receptive period; encourages the use of English for the negotiation of meaning through student interaction; provides opportunities for student-centered cooperative learning. Perhaps the best reasons for using manipulatives are that they are fun, they create student interest, and they work!Using them is a little like playing a computer game, and it's a lot more fun to do that than to sit passively and listen to the teacher. A Complete Course at each level, the "Short Cuts" student text features a balanced presentation of reading, writing, listening, and speaking materials to allow your students to develop all language skills - without having to buy a separate workbook! Each student text provides between 100-130 hours of language instruction. While "Short Cuts" was designed to correlate to the California Model Standards of Adult Education, the series correlates to most other standards as well. Further information about placement is found in the preface to each student text. Each of the three books in the "Short Cuts" program is divided into ten thematic chapters. Each student text also includes worksheets (and manipulatives) for each chapter, audio tapescripts, and a complete conjugated list of all verbs found in the book.Other highlights of each student text include: lively chapter themes and situations that encourage classroom communication; clear and colorful illustrations to aid comprehension; self-study review pages for each chapter so students can check their own progress; an innovative visual presentation of grammar, along with practice exercises, and more! Flexible supplements to meet your classroom needs All the supplemental materials included in the Short Cuts program work together to help you provide a truly communicative learning experience for your students. We encourage you to mix and match these supplements to fit your particular teaching style and classroom configurations.Teacher's Manipulative Kit - Poster Version Teacher's Manipulative Kit - Transparency Version - These kits correspond directly to the student worksheets found in each text. The poster kit comes with a set of adhesive manipulatives; the transparency version comes in color acetate form. You can use either kit in many different ways - model specific language activities, introduce new vocabulary, create information gaps - the list is endless.The Teacher's Audio Cassette consists of two separate audio tapes. The first tape contains recorded versions of all the dialogues found in the Listen sections of each lesson of the book. The second tape is the same tape as the Optional Student Audio Tape; it features passages from the self-review sections of the book. Since all tapescripts are printed in the student text, both audio programs are optional - you decide when and how to use them! The "Teacher's Manual" contains a wealth of helpful ideas and suggestions for using all of the materials in the Short Cuts program - including detailed lesson plans for each chapter! It is ideal for low-beginning ESL students.